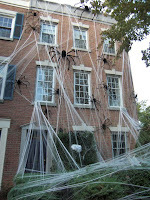 I have started to make some Halloween decorations for the party we are having on Oct 31st. I always love party planning and being the hostess with the mostess ; ) I have made the invites to be posted, stating a formal dinner hosted by Lord and Lady Carrington, but when the guests arrive they will be greeted by Igor and Frankenstein's bride in a haunted house! I have made shopping lists and started the menu. I have ordered some supplies, a fancy table cloth with spider webs, straws and silver/black serviettes. And last weekend Dave and I started to make some cardboard gravestones for the front garden. He was keen to help and is going away next week, besides it never hurts to start early : ) We started with some slim boxes (Thank you Rock Band) and moulded them even further by cutting, bending and tying the cardboard together. I am often finding interesting and clever quotes from famous philosophers & thinkers of our time and often jot them down in my journal. I thought I would share some of my favourite quotes from Albert Einstein who was a smart man in so many ways. Well after just getting back from Alcon and having un-packed everything from the car I am pooped! I thought I'd give a diary post review of what our weekend involved and what it was like. Its quite long but I hope I covered everything and don't sound too negative! On saturday I was raring to go, we went to the anime breakfast club at 10am and watched a wonderful anime called "the girl who time travelled". After that we had fun in the video games room and David came 2nd in the Mario kart Wii contest : ) They also had this awesome Rock Band drum kit with 4 cymbals and a hi-hat : D The DDR tournament had a bit of a delay but we eventually got going although disappointingly Alex got cut out in the first round! Later in the day was the masquerade. There was a couple of great costumes but most, unfortunately, left a little be desired. I admire the effort put into costumes as a cos-player and costume lover myself, maybe I'm getting cynical or maybe I'm just getting too old for this but it did seem like a bit of a lame convention >_> I did have a good time, found some new things, I totally glomped Bowser and was very excited by the portal girl, kudos to you my friend! On Sunday breakfast club was cancelled and we found out too late we were supposed to check out at 9.30am but we got it sorted pretty quickly and didn't loose our deposit. Once again not very well organised was the rockband competition, actually it was guitar hero and we won anyway so who cares : D The other things I wanted to do clashed with this so I missed out : ( We didn't go to the cosplay cafe as £3 is a lot of money for a cup of tea and some cake!! We did enjoy the AMV chillout though, for a couple of hours we sat reading our new mangas (Alex with his new Magic cards) and David had a nap ; ) The band that played, Machina Shogunate, we were really good too.